Dorothy (Dot) Marie Uren, 93, of Allen Park, MI, passed away on January 21, 2019 in Grand Ledge, MI. Dorothy was born August 4, 1925 in Milwaukee, WI, daughter to Melvin and Hazel (Pedersen) Anderson. Dorothy was an amazing seamstress, and loved the game golfer. 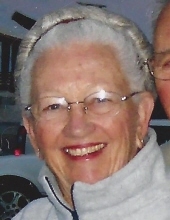 Along with her husband Jim, Dot owned and operated the Blue Lake resort in Fountain, MI for 23 years and then retired to their home on Bear Lake in Bear Lake, MI. They spent their summers there and their winters in Gulf Shores, AL. She is survived by her three daughters: Marcia (Gary) Komondy, Connie (Frank) Sabo, and Pam (Dr. Jim) Voltattorni; six grandchildren: Jim (Lori) Komondy, Jeff Komondy, Chelsea Sabo, Taylor (Christian) Ostrom, Nick Voltattorni, Kendall Rae Voltattorni; two great grandchildren, Lidia Komondy and Tyler Sabo, and sister Beverly Meeuwsen. She was preceded in death by her husband of 66 years, James “Jim” Uren in 2011 and 6 siblings. To send flowers or a remembrance gift to the family of Dorothy Marie Uren, please visit our Tribute Store. "Email Address" would like to share the life celebration of Dorothy Marie Uren. Click on the "link" to go to share a favorite memory or leave a condolence message for the family.